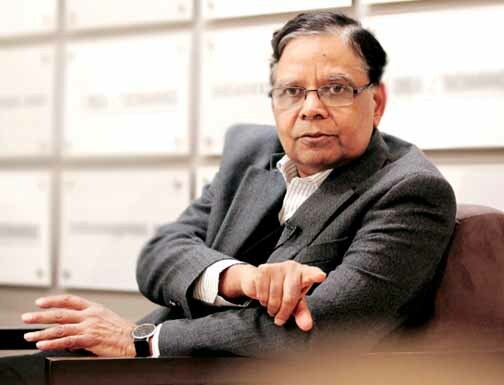 Vijayawada : The vice chairperson of NITI Aayog, Arvind Panagariya, on Wednesday took stock of various welfare schemes in Krishna district of Andhra Pradesh. Speaking to the media-persons in Vijayawada, Panagariya said that even though AP is facing issues due to lack of funds, it is still progressing very fast. Calling Chief Minister Chandrababu Naidu as a dynamic leader, Pangariya said that Chandrababu is successfully leading the state and pointed out that the interlinking of the Krishna-Godavari rivers was a great event. While assuring that the Centre would do its mite for the development of AP, the NITI Aayog Vice Chairman didn't bring up the issue of AP Special Status which is the centre point of the AP Reorganisation Bill. "Immediately after his arrival from Delhi, Panagariya reached Jakkampudi village on the outskirts of Vijayawada where he visited the Polavaram right canal which links Godavari and Krishna rivers," an official release stated. He was apprised about the importance of the canal and the area it will bring under irrigation by Water Resources Minister D Umamaheswara Rao. Rao briefed Panagariya about the progress of various ongoing irrigation projects in the state. "Pangariya was also told about the state government's ambitious plan to divert water of Krishna river to four districts in drought-prone Rayalaseema region," the release said.